atlas design collection, based on a social inclusive design process, is launched at Design Week Turkey between 16-18 November 2018 in Istanbul Haliç Congress Center. feed, curated by Bilgen Coşkun and Dilek Öztürk, is bringing immersive works of DAY Studio, Ömer Pekin, and Pınar Akkurt together at Brussels Design September between 4-30 September 2018. Co-founders of in-between Dilek Öztürk and Bilgen Coşkun discussed today's retail design paradigms around constantly changing consumer habits with i-am Group Partner and Managing Director Emre Kuzlu. Co-founders of in-between Dilek Öztürk and Bilgen Coşkun discussed why brands need editorial content to create organic influences with selected cases. 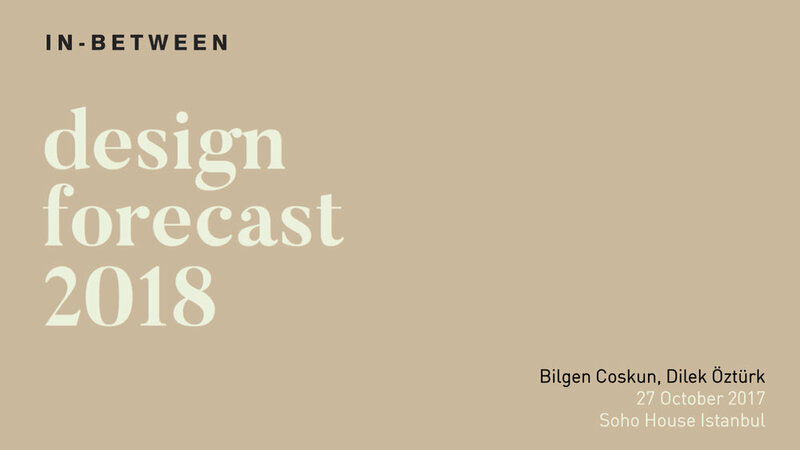 Co-founders of in-between Dilek Öztürk and Bilgen Coşkun highlighted rising values and future directions in the global design scene with selected cases. We are teaming up with Swatch for in-between live Venice Biennial edition from the 57th International Art Exhibition, featuring the art scene with one-minute interviews focusing on celebrating humankind through art. "The State of Design” studio at Istanbul Bilgi University Department of Industrial Design realised in collaboration with FRAME Magazine Academy Program as a part of the 3rd Istanbul Design Biennial. “Design for a phygital world” panel series are organised in partnership with Frame Magazine as a part of the 3rd Istanbul Design Biennial’s Parallel Events Program..
ISTANBUL-IN BETWEEN is teaming up with the world’s leading spatial design publication FRAME for “What’s the matter? – Design for a phygital world PART II”.